(Taipei, Taiwan, May 31, Computex 2005 ) AOpen, one of the leading IT platforms and solutions product providers in the world, debuts its full series ePCs at the Computex Taipei 2005. “ePC”, an abbreviation of “entertainment PC”, makes AOpen one of the first suppliers of digital home entertainment solutions in the world. Because ePCs are designed for home entertainment, the look-and-feel of the ePCs are designed to look like consumer electronic products which can be arranged in a rack for home audio and video equipment. “The ePCs are based on digital entertainment platforms which can fit ideally in different users environments,” said Bernie Tsai, president of AOpen. “AOpen Media Center Server 400/410 is an ideal choice for the main living room, while AOpen XC REC6 is a model for the sitting room,” Tsai elaborated. The various models of ePCs form AOpen’s digital home entertainment solutions and are used in different scenarios. The ePCs are showcased in different scenarios at Computex Taipei 2005. 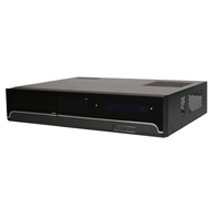 AOpen Media Center Server 400/410 is designed to look like a conventional audio amplifier. The housing of the innovative product is designed with storage space for seven hard drives. The system is developed with the functions to receive video streams from multiple TV channels. A user can record video streams or TV programs of up to three different TV channels with built-in hard drives. The user can manage, edit, browse, or play back the recorded video streams or TV programs recorded in the system hard drives. The system also supports multiple screen output. A user can display the video output of different TV channels to separate video output devices such as a HDTV or plasma display. The Media Center Server 400/410 is ideal for a home with multiple TV sets. The system is built with vacuum fluorescent display (VFD) panel which shows the system playback status clearly. The remote control of the system enables users to operate the system conveniently. “Powered by the functions of high performance AOpen Media Center Server 400/410, the users can watch and record TV programs, play music CDs and MP3 music, play VCD and DVD movies,” explained Vincent Cho, VP and GM of Solution Products Business Unit. “As the most powerful digital home entertainment platform in the IT industry, the product is expected to start a digital home entertainment revolution in the near future,” Cho predicted. * Built with large size VFD which shows system playback status clearly. * Designed with dual-channel TV tuner – the user can watch the program of a TV channel while recording the TV program of another TV broadcast station. * Supports Microsoft Windows XP Media Center Edition. * Supports 7.1-channel surround sound. * Supports Intel Pentium 4 2.8GHz 820 processor which is designed with dual core and Hyper-Threading technology. * Supports dual channel DDR II 533/667 MHz and expandable to 4 GB. * Provides PCI-Express x16 and PCI expansion slots. * Provides one ATA and six Serial ATA connectors. * Built-in 250 GB hard drive. * Built-in DVD Combo drive. * Built-in 10/100/1000 Mb LAN interface. * Full function remote control. * Provides S-Video, YPbPr, and D4 video output connectors. Although AOpen XC REC6 is also designed for providing digital home entertainment, the look-and-feel of XC REC6 is totally different from that of AOpen Media Center Server. The stylish and super slim XC REC6 is only 6.9 cm (2.72”) in height, making it ideal for sitting room. Despite its compact size, the product features the VFD panel and the push buttons which allow the user to operate the system easily and examine its operation status. Even though it is one of the slimmest desktop PCs in the world, the small size does not mean performance sacrifice. It supports nearly all important audio and video interfaces including S-Video, YPbPr, and D4 connectors for displaying video output to HDTVs or LCD screens. AOpen XC REC6 is designed to be driven by Intel Pentium M processors, which consume less electric power, generate less heat, and run quietly. * The size of the product is only 8.9 liters – nearly the same as home electronic products. * Provides one 5.25” and one 3.5” drive bay. * Built with a stylish VFD panel to show operation status. * Supports multiple-channel audio outputs. * Supports Intel Pentium M Dothan processors. * Supports Intel i915G and ICH6 chipsets. * Supports dual channel DDR II 400/533 MHz. * Provides ATAand Serial ATAconnectors. * Provides S-Video, YPbPr, D4 video output connectors. * Provides USB, IEEE1394, and HD Audio 7.1-channel sound. * Built-in 10/100/1000 Mb LAN connector.